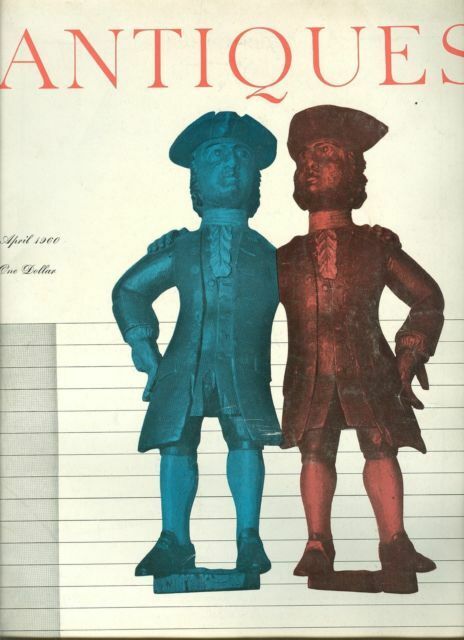 Home » The Book Market » Antiques Magazine April 1960-1700's Pewter;Religious Decorative Arts of 18th c.
Antiques Magazine April 1960-1700's Pewter;Religious Decorative Arts of 18th c.
Antiques Magazine APRIL 1960 · 18th century English Woodcarving- Colonial Furniture; · Religious decorative arts of 18th century Portugal; · The secretary with the tambour cartonnier; · An antiques survey: 18th century pewter; · Fine American ceramics of the Victorian period; · Great Antique Collecting Tips. · Plus much more... · Great ads and pictures. · Pages 315-414. Condition: Clean, no tears or missing pages. Has no address label on cover. May have small tears at corners. The Magazines Are In Pretty Good Condition - The Covers Are Worn In Places From Use. The Semi- Gloss Pages Have Become Yellow With Age And There Is A Mild Moisture Edge Stain On Some Pages. This In No Way Detracts From The Vivid Photos, Illustrations Inside, And Text Which Lie Beyond In The Many, Many Pages! Beyond The Pages Are Countless Pointers And Trends Of Antique Collecting. · The contents of these magazines are great for any budding ANTIQUE collector, designer architect, or anyone looking for some VINTAGE inspiration. · Excellent source of collecting research, information and expanding your library of knowledge! · Antiques Magazine is a publication made for antique lovers and history buffs and its pages are loaded with photos of artistic paintings, rare pictures, and other items of similar nature. It is a magazine for those who love antiques and also those who consider themselves historians since many articles deal with historical collections of art and antiques. · A publication dedicated to creative art and history -- these vintage issues would make a great gift for a collector! · Each magazine has pages of information on antique collecting and great period pieces. · Many Articles on subjects ranging from wide spectrums: Colonial Arts, Early English silver, cabinetmakers, Porcelain English Furniture...And Much More. · Antiques Magazine - very good for searching important items of art, furniture and glass to use for reference and information -you can use to help document provenance as well as great information. It’s interesting to see what was for sale way back then - from silver to 18th century furniture, glass porcelain. · Filled with Interesting and Great Vintage Advertisements; Plus much more. · SIZE; 9” x 12” inches; 200-300 Pages in Most Issues; · · Please check the other items in my store. I keep a large variety of items and I am always happy to combine shipping, when possible. I would appreciate it if you would let me know if you are bidding on multiple items. And PLEASE TRY TO PAY IN 3 DAYS. I realize shipping costs are much more than we want to pay, but keep in mind that eBay charges sellers 7.5% of shipping fees and I must pass that on. My goal is to be a 5 Star Seller. If you are happy with your purchase, please take time to leave appropriate feedback. If not satisfied, please contact me (? *,-./and I will work with you to resolve issue. I am not an expert on the items I list but I try to list as honestly as possible. I ship the day after payment has cleared or within 3 business days, with the exception being weekends and holidays. See all my 1960 issues of this Antiques magazine. I combine shipping. Powered by eBay Turbo Lister The free listing tool. List your items fast and easy and manage your active items.